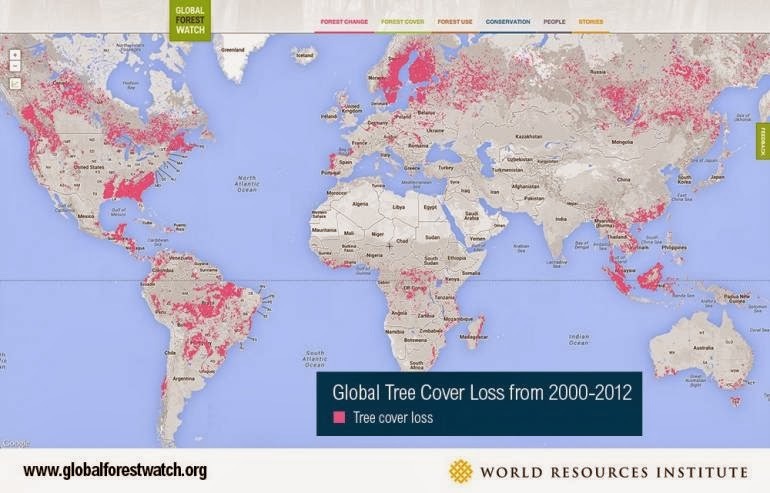 What the site does is combine the information capabilities of Google Maps and Google Earth Engine, research done by the University of Maryland, and Landsat imagery at 30 meters resolution to track tree loss and reforestation by year from 2000-2013. The global information will be updated annually, except tropical forest information which will be updated monthly in the future. Some findings are startling. According to the International Business Times article, and Global Forest Watch website, over 230 million hectares of forest were lost between 2000-2012. This is an area just slightly smaller than Sudan or Algeria, or a bit larger that the Democratic Republic of Congo. The losses were primarily caused by forestry, agriculture, drought or forest fire activity. 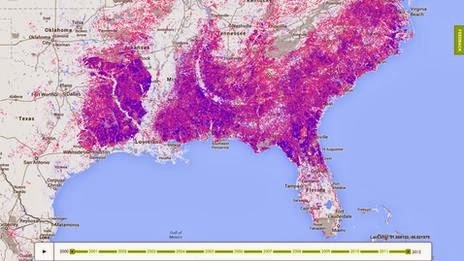 An example of the complex portrayal of deforestation and reforestation is that in the southeastern United States from 2000-2012. Here the losses in pink, and reforestation in blue are readily apparent. Another feature is being able to measure deforestation and reforestation in a given area by year. However, the shorter time periods do not seem to track the changes nor calculate areas consistently. The longer time frames capture more representative, yet not exact, change for larger areas. While the conversation in articles has been about monitoring of illegal logging, mining or land clearing for agriculture, etc, the imagery is also a very useful tool for determining areas lost to forest fire or drought. That knowledge may provide a basis for estimates of the impact on CO2 and CH4 release or sequestration in forests, and also black soot produced by fires. One element that may be useful is the total carbon forest stock function, but it is limited to tropical regions, which is unfortunate. Being able to see similar calculations for the Arctic would be helpful. Also, the site has a country by country analysis page. Another capability that would improve the site is being able to overlay fire areas, and also drought mapping, perhaps those will be future additions. If we are entering an El Nino by this fall, the warmer temperatures or drought may trigger higher CO2 release globally and may bring much needed rain to Brazil. More on global drought in the next post.